A group of lawyers and activists held a silent protest on Monday outside Hong Kong’s Court of Final Appeal, marking the third anniversary of the Chinese government’s large-scale crackdown on human rights lawyers. The China Human Rights Lawyers Concern Group (CHRLCG) and a group of lawyers stood for seven minutes and nine seconds, representing the date: July 9, 2015. 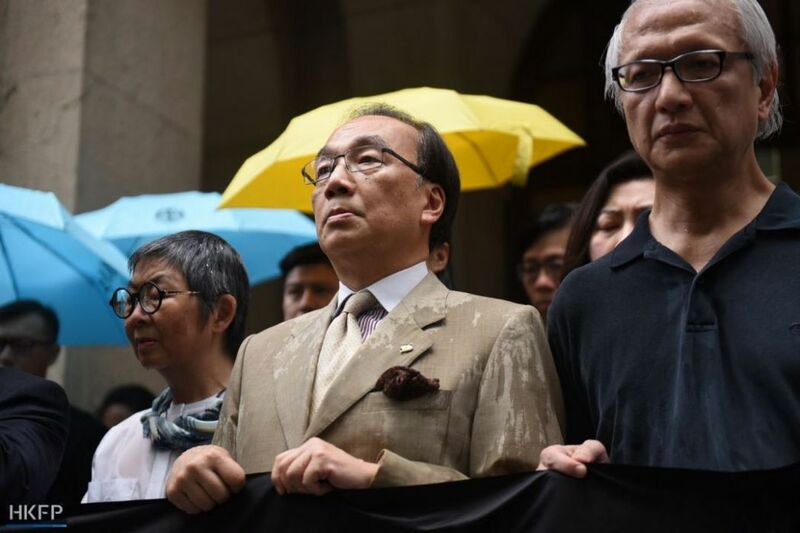 CHRLCG chairperson and former lawmaker Albert Ho said the move was to support the “imprisoned, detained, tortured” lawyers and to protest the Chinese government’s continued suppression. 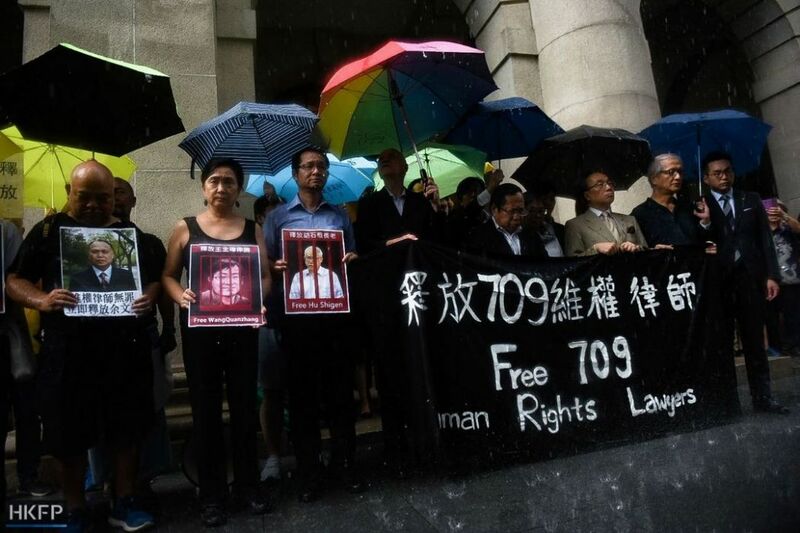 The “709 crackdown” began on July 9, 2015 when around 300 human rights lawyers, legal staff, and activists were arrested across 25 provinces and were detained for months. 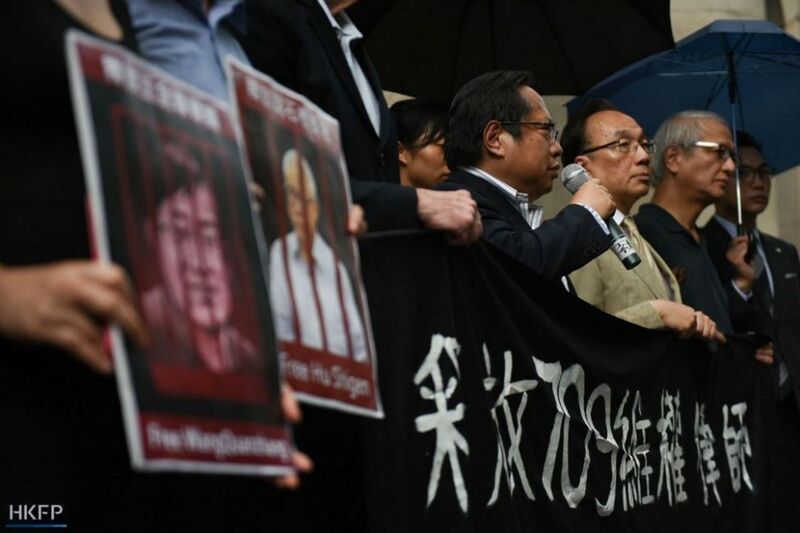 At the silent protest, participants stood in the rain holding portraits of activists including Wang Quanzhang, Yu Wensheng and Hu Shigen. “It is the duty of lawyers to protect the people’s rights and seek justice… but Beijing destroyed the country’s institutions, and even those who serve the law cannot be protected,” Ho said. Ho added that, since last October 16, lawyers have been targeted, and their own legal representatives have been harassed and had their licenses revoked. In particular, Ho also said the world is “shocked and appalled” by the Chinese government’s treatment of lawyer Wang Quanzhang, who “vanished” and has not been heard from since his initial arrest three years ago. Other attendees at the event included political heavyweights in the legal profession such as Margaret Ng, Alan Leong and Audrey Eu. The protest was also supported by the Civic Party, the League of Social Democrats, the Progressive Lawyers Group, and the Hong Kong Alliance in Support of Patriotic Democratic Movements of China. Ho said there was a growing trend of “administrative punishment” where the Chinese government used lawyers’ licenses as a tool of control. “This is a change in how the government’s strategy, to use arbitrary revocation and invalidation of lawyers’ licenses to keep human rights lawyers in check,” Ho said. He also described the Chinese government’s strategy of targeting the lawyer’s immediate family as “feudalistic” – referring to the draconian punishments used by rulers in China’s history. “Lawyer Wang Yu recently revealed that she agreed to confess on television only because her son was harassed every day by the police,” Ho said, calling it a human rights violation. 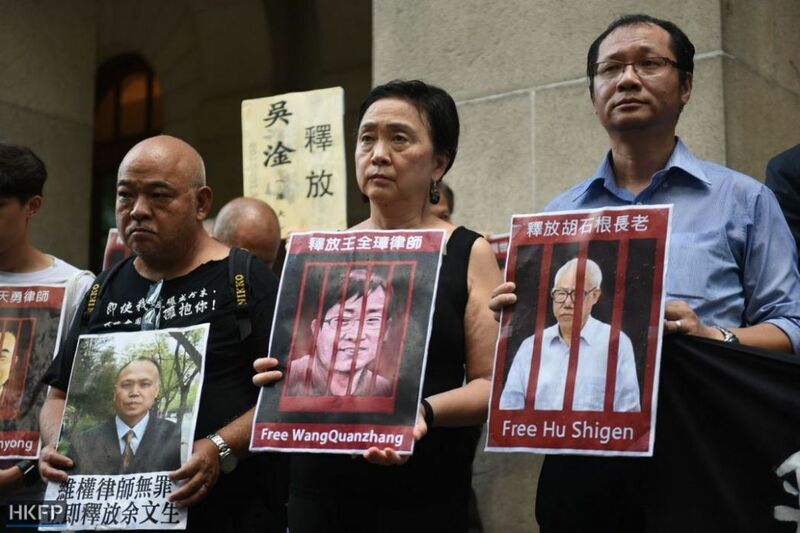 Other human rights lawyers still under detention include Zhou Shifeng, Jiang Tianyong and Yu Wensheng; and activists Hu Shigen, and Wu Gan, all of whom have been convicted of “subversion of state power” – a common charge used against dissidents. Barrister Alan Leong said that the continued suppression of human rights lawyers shows that China has no rule of law.